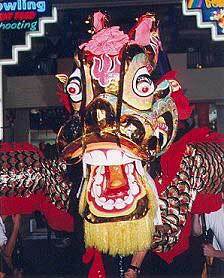 The Chinese Dragon is a very important creature in Chinese Culture. It is their most sacred animal and was the emblem of the Chinese Emperors, and is a symbol of strength. During the Sung Dynasty (960-1279 AD), the Dragon Dance was at its most popular, and still remains popular today. Performed at any time of day, it is one of the most spectacular dances performed by the Chinese. 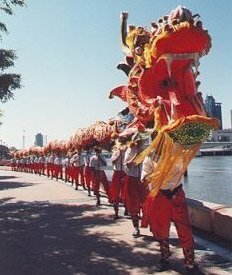 Just like the Lion Dance, a Dragon Dance can be performed for a variety of reasons, the most popular being to honour the Chinese New Year. The Dragon is a powerful, yet friendly and helpful, creature that is associated with good luck and longevity. Dragons come in varied lengths, and it is conceded that the longer the dragon, the more lucky it will be. A dragon can easily require 20-90 people to control the body. Another person controls the head, and yet another person sets the dragons path and movement with the use of a lantern or “fireball”. Musicians – a drummer, cymbals and a gong, may also accompany a dragon. They play a beat in time with the dragons movement. Kung Fu schools often perform the Dragon Dance. Just like the Lion Dance, the Dragon Dance is not just about ceremony. It requires skill, strength, agility and endurance to perform a Dragon Dance, and as such is an invaluable training tool for the Kung Fu Practitioner.